Reaction network diagram of the apoptosis-autophagy crosstalk model. Autophagy is a cytoprotective homeostatic process in which cells digest their own cytoplasmic constituents or organelles, and degrade them in the lysosomes, in response to diverse stress stimuli. The resulting products can be recycled to generate energy and build new proteins, hence the activation of autophagy as a protective mechanism against starvation. Autophagy also serves as a cellular quality control process that removes damaged organelles or aggregates of misfolded proteins that may otherwise cause a broad range of diseases, including neurodegenerative disorders and liver diseases. Yet, excessive autophagy has been linked to autophagic cell death, and autophagy activation has been pointed out to be harmful under certain disease conditions (e.g. cancer), while recent studies suggest that autophagy might represent in those cases an attempt to prevent the inevitable demise of the dying cells. The modulation of autophagy has thus emerged as an important therapeutic strategy for several diseases. Due to a complex crosstalk between autophagy and apoptosis, it is often unclear which specific interactions contribute to pro-survival or pro-death effects in a given disease. In a recent work, we present a tractable mathematical model to assess how cells orchestrate the dynamics of signaling networks to make life vs. death decisions, and how these are modulated by pharmacological interventions. 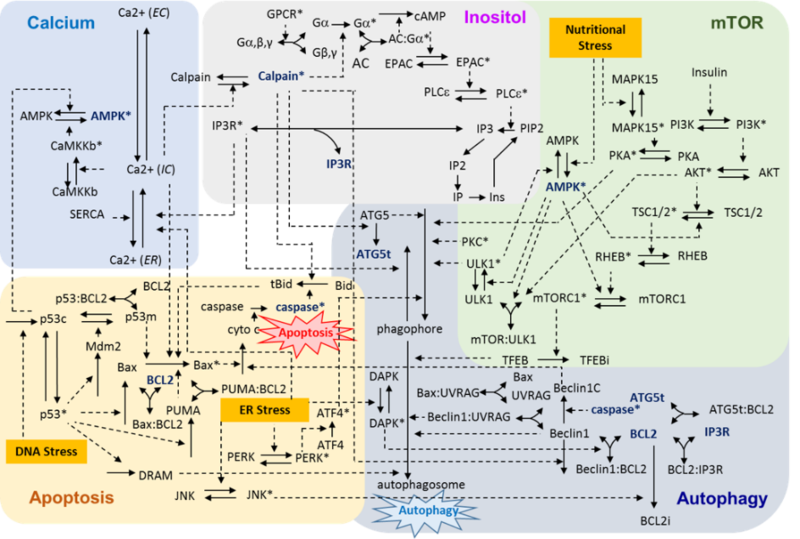 Our model includes mTOR and inositol signaling autophagic pathways and intrinsic apoptosis pathways as well as their crosstalks mediated by Bcl2, caspases, p53, calpain and Ca2+. It captures cellular heterogeneity, and closely reproduces the differential initiation and time evolution of autophagy or apoptosis in response to nutritional, genotoxic, or endoplasmic reticulum (ER) stresses observed in single-cell experiments. Recent evidence led to a debate on the existence of autophagic cell death (ACD). Our current understanding is that though ACD exists in rare situations, a more general scenario is that autophagy precedes apoptosis in the same cell in order to adapt to or cope with non-lethal stress, and apoptosis occurs when the stress exceeds a critical threshold of intensity or duration. Our study provides firm quantitative description in support of the validity of this interplay between autophagy and apoptosis. In most cases, autophagy and apoptosis mutually inhibit each other and the onsets of autophagy and apoptosis are governed by cell fate decision processes that have broad pathophysiological implications. Our analysis identified a core regulatory network for autophagic and apoptotic responses. Specifically, cytoplasmic Ca2+, p53, AMPK, calpain, Beclin-1, and Bcl-2 emerged as key components whose expression and/or activities significantly affect cell decision. Ca2+ and p53 act as master regulators that tightly control cell decisions through AMPK and Bax activation pathways, respectively. Cleavage of Beclin-1 by caspases confers a concrete switch from autophagy to apoptosis. A positive feedback loop formed by components in the Gα signaling and inositol pathways including calpain is critical to exerting the pro-apoptotic effect of cytoplasmic Ca2+, which in parallel maintains a graded autophagic response through a feedforward loop mediated by Ca2+/calmodulin-dependent kinase kinase β (CaMKKβ) and AMP-activated protein kinase (AMPK). Our model also predictes that the CaMKKβ activation may act as a determinant of the dual/opposite roles of cytoplasmic Ca2+ as well as treatment efficacy. While increased cytoplasmic Ca2+ usually inhibits autophagy (in favor of apoptosis), this effect can be reversed in cells that express high levels of CaMKKβ. Our results explain how cells 'assess' cellular damage and make a 'life' or 'death' decision upon activating autophagy or apoptosis and highlighted the significance of cytoplasmic Ca2+. They also demonstrated that the proposed model can be advantageously used for interrogating cell regulation events and developing pharmacological strategies for modulating cell decisions.